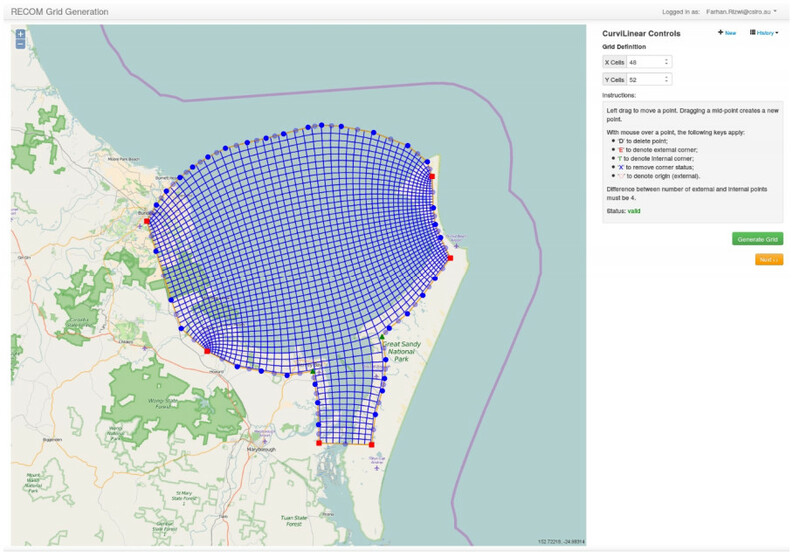 The eReefs modelling system includes a 1 km and 4 km resolution model domain and the relocatable estuary model RECOM which is able to be used by specialist users and managers. All of these models include integrated 3 dimensional hydrodynamic, sediment, and biogeochemistry and ecology modelling systems. There are three ways to access eReefs models, each of which is intended for different types of users (Click on maps below to go to model pages). 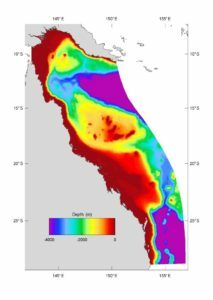 The models address multiple spatial scales, ranging from whole of GBR (thousands of kilometres) to individual reefs and estuaries (hundreds of metres). GBR 1 and GBR 4 provide 3-dimensional hindcasts and near real-time models for the eReefs region. RECOM provides access to create model grids for specialist users and managers. The models operate in near real-time, and a hindcast archive exists back to September 2010. The eReefs models deliver information that addresses the scientific issues surrounding the GBR lagoon and reef; i.e. delivery of nutrients from the catchment, processing of those nutrients by estuaries, eutrophication potential, sediment transport, hypoxia, reef acidification and coral bleaching. Most of these issues require coupled benthic-pelagic sediment transport and biogeochemical (BGC) models to deliver the required system understanding and information. In order to successfully address these issues, the models are required to operate in near real-time and hindcast mode. The approach is to append near real-time results to an ever growing archive so that the models always remain current. Currently the 4 km model archive begins in September 2010 and the 1 km model archive in December 2014. 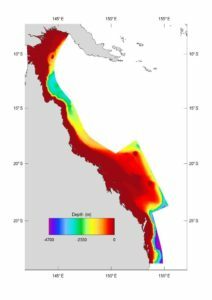 The modelling framework adopted for this study involves nesting a regional hydrodynamic model within a global circulation model, in order to provide accurate forcing data along the boundary within the Coral Sea, where mesoscale oceanographic processes strongly affect exchange between the Coral Sea and the GBR Lagoon. The regional model covers the continental shelf from the NSW border to the mainland of Papua New Guinea, extending eastwards into the Coral Sea Territories a sufficient distance to avoid the topographical complexities of the Queensland and Marion plateaus. The regional model is intended to simulate the dominant oceanographic processes impacting on the GBR shelf, including the significant mesoscale features of the South Equatorial Current (SEC) and the current jets that result from the interactions of the SEC with the Queensland and Marion Plateaus. The average resolution of the regional model is ~4 km. Within this regional grid, a more finely resolved model (the shelf model) with resolution of ~1 km is nested to cover the continental shelf areas and the adjoining tract of the Coral Sea. Output from the regional model is used to force the boundaries of the shelf model. Coastal locations or individual reefs may be modelled at high resolution (< 1 km) to capture important small-scale processes and dynamics using the relocatable coastal model (RECOM). This model can be deployed anywhere within the domain with minimal user input, making it useful for the development of site-specific coastal models by non-specialist users. RECOM includes sediments and biogeochemistry, and allows for the construction of more complex curvilinear grids. RECOM is currently one-way nested into the regional models.